When your lower back hurts – how long does it take you to find a comfortable position to sleep in? 30 minutes? an hour? never? It’s extremely difficult to fall asleep (and stay asleep) when you have pain in your lower back. And so the vicious cycle of low back pain and insomnia begins: when you have trouble sleeping, your back pain gets worse. And takes more time to heal. Seems a bit hopeless, but I assure you it’s not. A few simple modifications to your sleep position can help take the load off your lower back, while allowing you a full night’s sleep and faster recovery. You probably know this, but sleeping on your stomach is the worst sleeping position for low back pain, and for every one for that matter. Sleeping on the stomach flattens the natural curve of your spine and puts additional strain on your back muscles. At the same time, stomach sleeping rotates your neck, which can result in shoulder pain and neck pain. If you’re used to sleeping on the stomach, at least put a pillow under your lower abdomen and pelvis to ease back strain. Changing sleep habits may seem difficult, but there are a few ways to force yourself to the right sleeping position. 1. A Body Pillow – sleeping with a U-shaped body pillow will make it uncomfortable to sleep on your stomach and you will naturally roll to your side and stay side or back sleeping all night. A body pillow can be very helpful for night-time back pain, just see some of the many real reviews for it HERE. 2. A tennis ball in your T-shirt pocket – the more annoying option is to wear a pocket T-shirt with a tennis ball tucked into the pocket, which should definitely do the trick. Another bad sleeping position for low back pain is on the side with one leg hiked up higher than the other. This sleep position moves you toward stomach sleeping but also twists the pelvis. If you sleep like this, try to keep your legs together. Your pelvis will be well situated, and it can calm your nerves. Place a pillow between your legs to complement this position. The best way to sleep with lower back pain will be the one least irritating to the nerves and muscles in the lower back. In fact, there are 2 good positions, but one of them is not very comfortable for most people, and is not recommended for people who snore or suffer from sleep apnea. * Lie on your side, preferably on a flat and medium-hard mattress. * Place a pillow between your knees to keep your spine aligned. If your pain is severe, consider placing another small pillow under your waist. * Place your head on a thin pillow for back sleepers to prevent tilting of your neck. 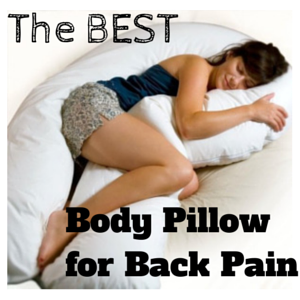 If you tend to sleep on both your side and your back – a contoured pillow like this one is highly recommended. * Place a medium-hard pillow under your knees to remove strain in your spine. Try to keep this position as much as you can. * Sciatica – on the side, pillow between the knees, or on the back with pillow under the knees. You can slightly bring the upper knee closer to your head. * Lumbar Osteoarthritis – sleeping on the side with knees curled up in the fetal position seems to be most comfortable. This helps open up the facet joints in the spine and can relieve any corresponding pressure. Sleeping in a reclining chair or an adjustable bed that allows the head and knees to be elevated can also relieve pressure on the facet joints. * Spinal Stenosis – most of the time, People with pain from spinal stenosis may prefer to sleep on their sides with their knees curled up (in the fetal position). This helps relieve pressure on the nerve root. Sleeping in a reclining chair or an adjustable bed that allows the head and knees to be elevated can also relieve pressure on the nerve. * Bursitis – people with inflammation of the bursa over their hips can be especially “sensitive” to pain from a too-firm mattress. * Hip Pain – sleeping on the side with a pillow between the knees. This decreases stress across the hip. * Herniated/Bulging lumbar disc – The most comfortable sleep position depends on the position of the disc. For a paracentral disc herniation (most common), most people may find stomach sleeping (with a pillow under the stomach). For a foraminal herniated disc, sleeping on the side in a fetal position usually feels better. See how to reverse a bulging disc naturally. One of the best ways to fall asleep fast and without pain is to place an infrared heating pad under your lower back, with a timer set for 30 – 45 minutes. The infrared heating pad is a science-backed and drug-free pain relieving tool, that I wish everyone had in their home. Infrared heat, invisible red light, penetrates deep into your skin, all the way to your muscles, nerves and bones – without feeling too hot in the process. It boosts your blood circulation in your back, bringing pain-relieving and healing agents to the area and quickly relieves back pain for up to 6 hours (no pills and works better). 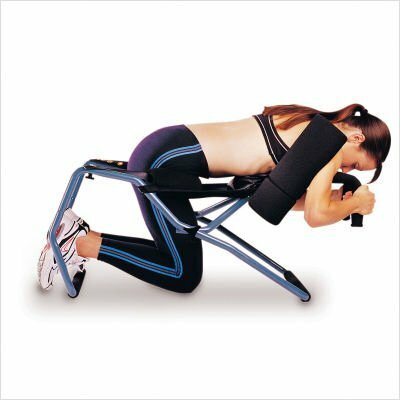 Rolling your back on a trigger point foam roller for a few minutes before bed, or using an electric percussion back massager can be a huge help and a wonderful preventative for lower back pain. Plus, it speeds up healing from muscle and nerve injuries, through boosting blood circulation. Back traction is considered one of the best natural treatments for back pain, especially if nerves and discs are involved. Home spinal decompression is easy and relatively low-cost, while providing an almost instant relief for lumbar pain. See my post about how to do back traction at home and possibly curing your back pain for good. · Avoid caffeinated drinks and heavy meals before bed. · Try to avoid sitting for long periods of time – many experts believe that prolonged sitting is the number one cause for back pain. · Practice relaxation techniques. A 5 minute meditation (when you just sit and concentrate on your breathing) can make a world of difference in your overall health. Getting out of bed the right way is just as important as your sleep position. 1. Roll onto your side and bend both knees. 2. Drop your feet over to the side as you push with both arms to sit up. 3. Scoot to the edge of the bed and position your feet under your buttocks. 4. Stand up, keeping your back in the neutral position. This concludes my recommendations for low back pain relief at night, I hope you found it useful and helpful. What about you? Have you tried changing your sleep position? Did it help?